MCCC science students serving as judges and mentors at the Olympiad. Making science hands-on and fun for elementary school studfents is the goal. West Windsor, N.J. – While the Winter Olympics in Pyeongchang, South Korea, showcased the very best athletes in the world during Feburary, New Jersey had its very own "Olympic" competition, designed to invigorate and test the minds of New Jersey’s budding scientists at the elementary school level. The New Jersey State Elementary School Science Olympiad, for ages 9 through 12, took place on Feb. 23, with approximately 200 youngsters from 12 elementary schools participating. Also rolling up their sleeves that day were ten Mercer County Community College (MCCC) students studying science. They included Tania Asmal, Ian Cunningham, Kim Barillas Godoy, Noah Danieki, Austin Chee, Mikayla Cruz, Tionia Logan, Sai Thang, Cristopher Villavicencio -Nimatuj, and Artemis Basile, who is double majoring in Math and Education. 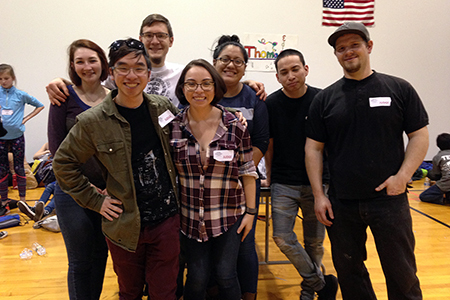 Under the leadership for Professor of Biology Laura Blinderman, MCCC students have volunteered for the Olympiad since 2015, serving as coaches, judges and awards presenters. 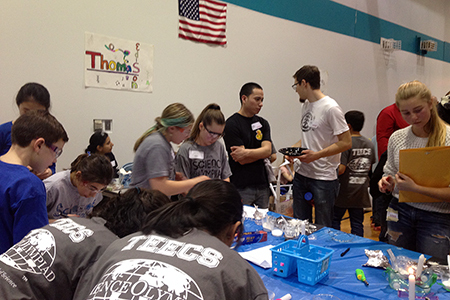 With an emphasis on making science fun, the MCCC students led hands-on engineering and chemistry competitions including Barge Building, Marshmallow Towers, Marble Roller Coaster, Identification of Unknown Powders, Sustainable Coolers (Cool It! ), and Straw Egg Drop. Blinderman explains that the Olympiad involves brainstorming about the use of everyday objects in the creation of functional tools. “Kids discover the challenge and satisfaction of applying science concepts to real world problems,” she said, pointing to the Roller Coaster Challenge, where teams of students build 3-foot roller coasters out of foam, tubing, found objects, and/or paper in their classrooms and then test their projects at the Olympiad. The coasters are judged for the number of loops, corkscrew turns, length, and ability of a marble to successfully navigate the roller coaster. Martha Kubik, the county’s Regional Science Olympiad Director, adds that the Olympiad has proven to be a platform for the best way to learn science – by making it fun and interactive. “It’s a great learning experience for all involved,” she said. "I commend Mercer students for their professionalism, confidence, and enthusiasm." More about the New Jersey Science Olympiad is avaiable here.